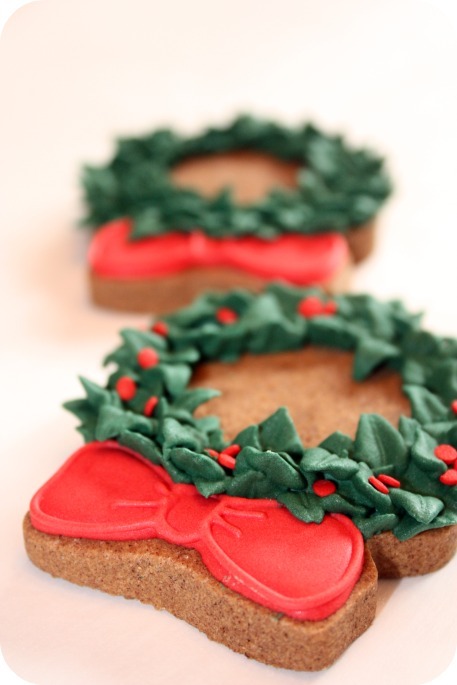 Decorating something quick and easy is what I was in the mood for when I went to use my leftover gingerbread dough. 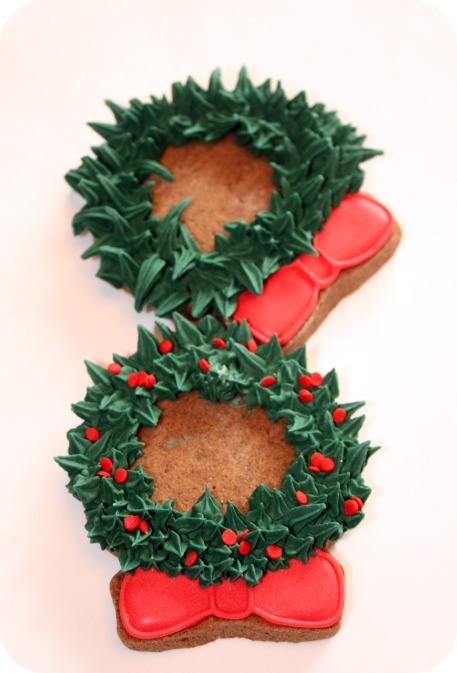 These decorated wreath cookies are easy peasy lemon squeezy to make. 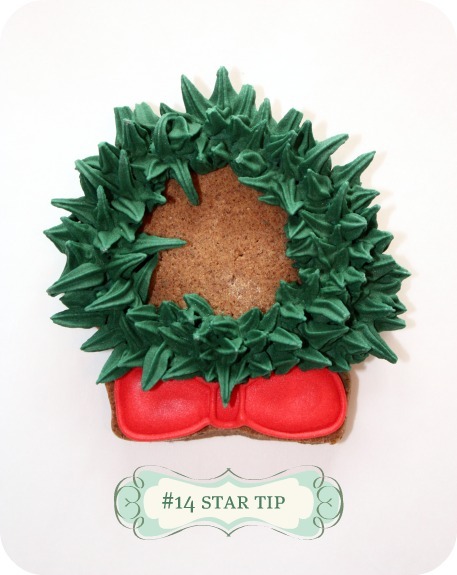 I tried a few different piping tips for the wreath ‘branches’ and have labelled each picture with the piping tip etc. I used for those branches. If you’d like to make these, the list of the things you’ll need is below. Holly berries add a bit of color. I just had to show you a few other things before the Christmas season is over. The first one you may have seen already; I stumbled across them last year, and haven’t forgotten them because they’re so extremely adorable. Megan of NotMartha.org is the talent behind these sweet creations. You can find a how-to on them here. 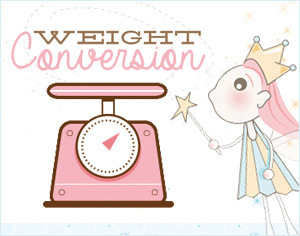 Her site is a must-see if you haven’t been there already; it’s chock full of creative ideas and tutorials. Second, this practical find from Costco. I’ve had it for months and keep meaning to share it here. 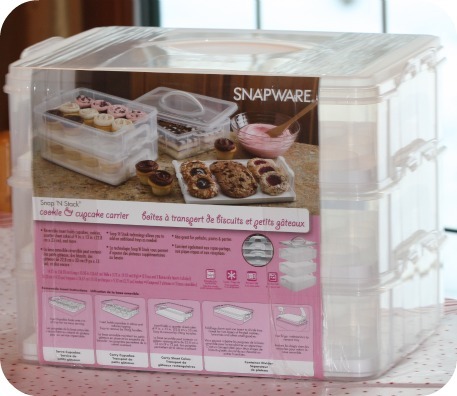 It’s a cupcake carrier, but works so well for storing or transporting cookies. And last but not least, in the spirit of Christmas, I’d like to share a wonderful thing Kraft is doing this holiday season, appropriately called Recipe for Joy. For every FREE e-card you send between now and December 31st, Kraft Canada will donate $2.00 to Food Banks Canada. Visit www.KraftRecipeforJoy.com and send a FREE e-card. An easy way to help the hungry and share some recipes too. *Note: It may take a minute for the page to load. 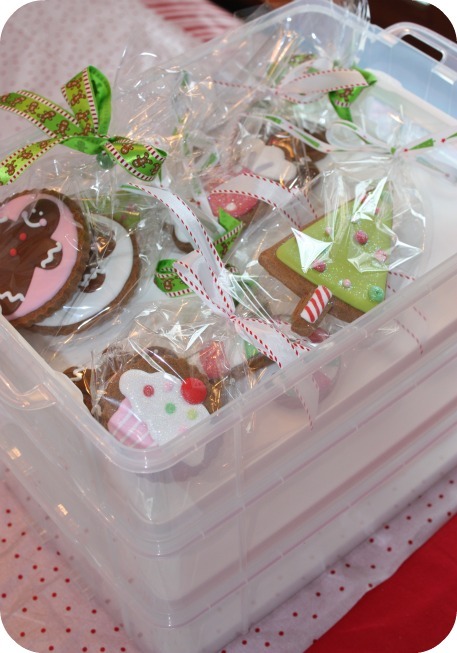 The holiday gifts they mention at the beginning are free holiday recipes. thank you for all the great “tips…no pun intended! wishing you a very happy & joyous holiday season & wishes for a bright new year! Thanks for sharing all your wonderful creations!! I use Antonia’s royal icing recipe and how it turns out for me is never that thick. Am I doing something completely wrong? What consistency would you say it needs to be to do that piping with the leaf/star tip? That’s the recipe I use. I mix mine for the full 10 minutes – try mixing it longer; that helps thicken it. Another option is adding more icing sugar a little bit at a time until you’re happy with the consistency. It has to be thick enough so that when you dip a spoon in and lift, the icing stands straight up. 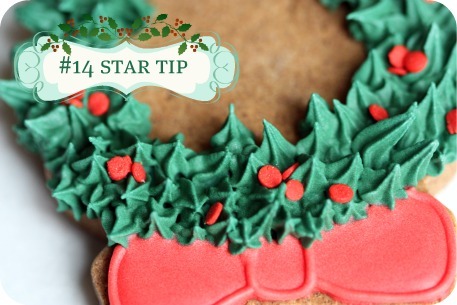 If you’re still not sure, take the star tip, press some icing through it and see if the stars hold their shape. 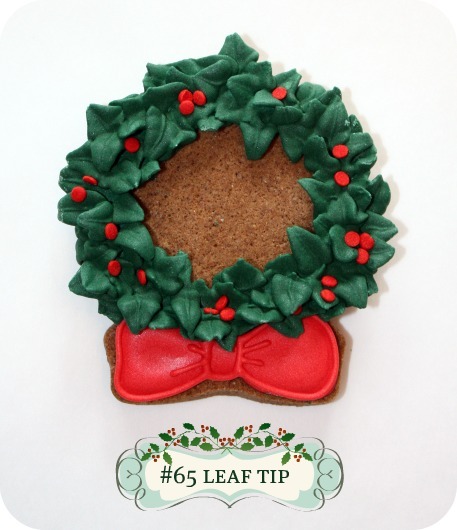 I love, love, love your wreaths! The birdhouses are adorable and I saw that carrier at Costco a few months ago. Didn’t pick it up and wishing I had. Hopefully it is there when I make my next trip. Merry Christmas Marian! All the best to you and your family in the New Year. Love your wreaths, Marian! Wish they bring those carriers to Costco… Wishing you the best holidays!! I love the cookies! Also, thank you so much for sharing the Kraft site. I have been meaning to donate food, but haven’t gotten out to do it yet. This I a great way to help out the hungry. I try to donate food at other times during the year too, because it seems the food banks are short especially when it’s not holiday season. I’m so in love with your work! 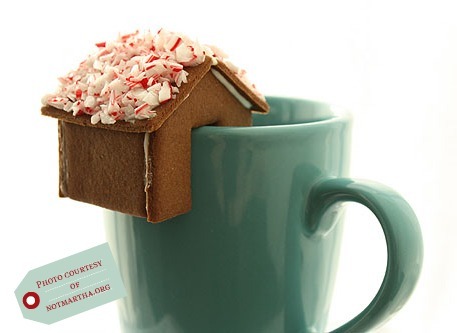 How do you get the icing on the cookie so neat? ?I know you use a projector…but still? I normally use sugar frosting..is royal icing better for some reason? You had way too much time on your hands this week, you should have been at my house yesterday and today doing my Gingerbread houses and cookies 🙂 As always, you are far too talented! 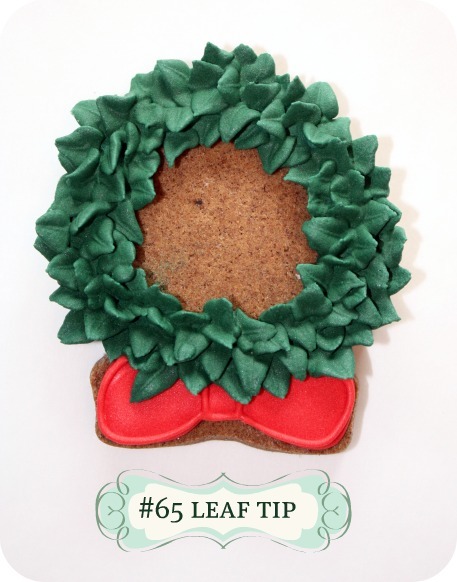 The leaf tip is so perfect for the little wreaths! 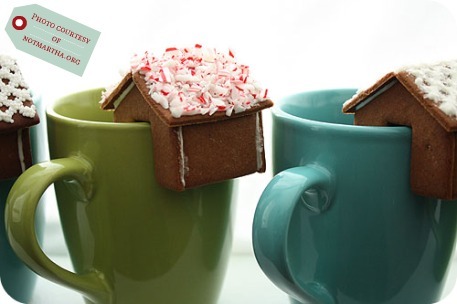 What a great idea, they turned out so nice! Merry Christmas! 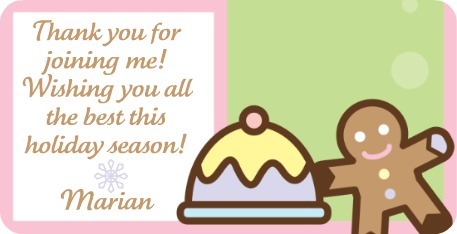 Thank you for showing all your beautiful cookies, tips and tricks over the past year! I love your website and look forward to reading it every time. Merry Christmas to you and your family and a very happy 2011!!! Hi Marian, I am about to purchase a new printer for baking etc. and wanted to know which model you use for your cookies as the pictures come out so clear. Thanking you in advance for your kind response and all your amazing guidance.